1. Lay the beans out on a flat surface and pick out any stones or damaged beans. 2. Rinse them in water. 3. Let the beans soak overnight in the 5 cups of water and with the green pepper, sliced. 4. 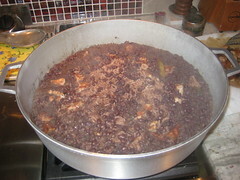 Cook the beans, and the 5 cups of water, without the green pepper, in a pressure cooker for 30 minutes. 5. Strain the beans and reserve 3 cups of the liquid for later use. 6. In a pot over high heat, render the fat from the bacon and separate grease into two portions. 7. Toast the rice in one portion of the bacon grease. 8. Set the rice, cooked bacon and second portion of the bacon grease aside. 9. In the same pot, over high heat, cook the pork chunks until they have rendered 4 Tablespoons of fat. Add oil to the pot if not enough pork fat was rendered. 10. Remove the pork chunks and set aside for later use. 11. In a food processor, blend the onions, garlic cloves and green pepper to make a sofrito. 12. Pour the sofrito blend into the rendered pork fat until heated through. 13. 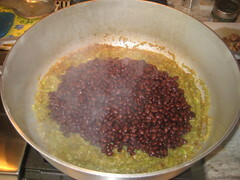 Add the black beans, liquid from the beans, bay leaf, salt and oregano over high heat. 14. When it all starts to boil, add the rice to the pot. 15. Leave over medium heat, covered, for 30 minutes. 16. Before serving, add the crumbled bacon and second portion of bacon grease over the top. 2. Stuff with prunes all alongside the ham in the middle and place the meat into a plastic bag. 3. In the blender, make a mojo (marinade) with the minced garlic, black pepper and naranja agria. 4. Pour the marinade through the opening of one side of the meat and all along the top of the meat. 5. Cover the meat with onion and green pepper slices and close the bag. 6. Let marinade in the fridge for a minimum of three hours. 7. Take the meat out of the plastic bag and pat dry. Reserve juices for later. 8. Fry the bacon strips and remove the bacon for later use. 9. In the bacon fat, fry up the minced garlic clove until just brown. 10. Brown the meat and turn until all sides are seared and golden brown. 11. Add the juices from the bag and cook over medium heat for one hour. 12. Place the meat in a pyrex and cover with all the juices that were cooked with it. 13. Cover with plastic wrap and keep in fridge overnight. 14. Take out the meat, slice with an electric knife, into 2" slices. 15. Put the juices from the pyrex, along with the meat slices into a pot and cover. 16. 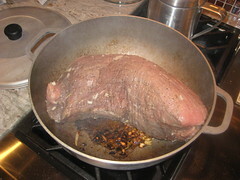 Once it starts boiling, reduce heat to simmer until heated through and meat continues to cook. 17. Add potatoes 30 minutes before serving. In my life, I swear I don’t think I’ve ever had boliche. And if I did, I didn’t know it was named boliche. I didn’t even realize that "carne asada con naranja" (as it is named in the cookbook) was boliche until my mother in law pointed it out. 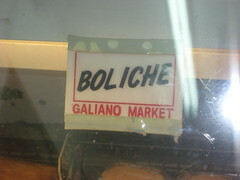 When I asked some folks at work about their boliche experiences, I was told that Galiano Supermarket had great boliche meat (Herald Top Chef Silvi) and that I had to ask the butcher to mechar (stuff) my boliche with a chorizo or ham (Ludas). Meat stuffed with meat? Oh yeah. My family was definitely in for a treat for Sunday dinner. To make things even more complicated, I decided to throw in some Moros y Cristianos (M y C) to the mix. Why not? I had two full days to plan the extravaganza. I figured I was going to need some professional assistance and help from the butcher at this Galiano place (off Douglas and Coral Way in Miami), so I asked my mom to come with me and we were off. As soon as we got to Galiano’s, I went straight through the produce section, picked up the onions, peppers, garlic, naranja agria (sour oranges) and regular oranges I’d need. 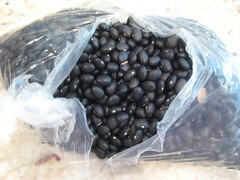 I also found a plastic bag with black beans that I could use for the M y C and was off to see the butcher. We can discuss the M y C vs Congri and the black beans vs red beans dilemma in person one day. When it was our turn, the butcher turned to me and I quickly asked him (or, maybe it sounded like a bark because I was a bit nervous) to clean the boliche and stuff it with a ¼ pound of ham. He asked me how much meat I needed and said I wasn’t sure and that we were feeding twenty people. Twelve pounds of meat should do it. Twelve pounds of meat = two six pound logs of boliche. Some babies aren’t even born at six pounds. This was a little shocking that I was bringing home what looked like two baby six pound dinosaurs. Shake it off. You’re Cuban. Meat stuffed with meat. And race/religion fuelled beans for a side dish. Go get ‘em, woman! Oh, and if someone would have told me that making boliche would take a true 24-hour time period, I would have…oh well, nevermind. I seem to say that quite often with this project. Thanks to the butcher, the tedious part of the prep was done – the meat was clean and mechado with ham. Thanks, butcher dude. 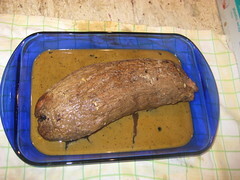 There was no way I’d make a ham stick and make it fit in a meat log so easily. 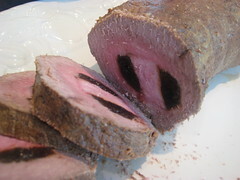 I stuffed each meat log with prunes and then made my mojo in the blender. Garlic, pepper, sour oranges. Pour into and over the baby dinosaurs that were put back in their original butcher plastic bags, cover with an onion and green pepper blanket and put the babies to sleep for three hours. After three hours, I took the meat logs out of the fridge and started frying up the bacon. Ha ha. Meat stuffed with meat, cooked in meat. Ha. Once I had rendered all the fat, I fried up some minced garlic and quickly asked (read: screamed) for my husband to help me. I needed to put the six pound dino babies in the bacon fat garlic before the garlic turned black on me. I was cutting it close! Alas, hubby came in, placed the first six pounder in and flipped it a few times for me as the dino baby was nice and browned. Once it got the golden sear I was looking for, I added vino seco and the juice from the oranges. I cooked this meat for an hour because over and over again I heard about how dry boliche can be and that you had to let it sit in juices, overnight, before fully cooking it. So once the hour was up and the meat was about medium rare, I put it into a pyrex and let it go back to sleep in the fridge, with all the juices from the pot. And then it was time for the second dino baby. Repeat: Bacon fat. Garlic black. Hubby help. Let’s not forget that the M y C need an overnighting of their own. Soak the beans in water. Forget about them while you sleep, exhausted from the pre-boliche madness. When you wake up and you realize all the work you did – and the work you still have to do, you wonder how the ladies (abuelas and tias that slaved in their kitchens for us) really liked all this and why. I sliced the medium rare meat with my electric knife. Without an electric fork, however. Moki never did find that electric fork she swore existed. Beautiful round slices of meat, ham and prunes. So beautiful, you get that amnesia us moms have when we decide it’s time to have siblings for our first born. Same thing. The ladies must have suffered from the amnesia as well. Once the amnesia from the night before set in, this day was easy. The slices of beautiful boliche would go into a big pot with all the juices, onions, peppers and some potatoes (that weren’t in the recipe but my consultants made me include) over low heat until the guests arrived. Really, this dish was ready and simmering for when the family of twenty arrived. And then, the M y C, which were also easy because once you finish with the black beans in the pressure cooker to soften and separate the liquid from the beans for cooking, you were well on your way. I had efficiently asked the butcher to cut some pork into little cubes for me, so they rendered their fat quickly and I threw in my sofrito green paste made in the food processor with the Cuban trilogy (garlic, onions and green peppers). I added in the rest of the stuff and once it started to boil, I threw in the rice. Wait, I forgot to mention meat recently. The rice had been toasted in some new bacon fat. Ok, resume your reading. All this cooked over low to medium heat for 30 minutes and by the time everyone was ready, all I had to do was sprinkle some bacon crumbles and extra bacon fat over the top before serving. Sunday dinner. What a blessing. With reactions just like the one from my niece below, it's no wonder the ladies sure knew what they were doing. 2. 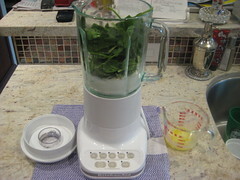 In a blender, osterize the flour, milk, salt and spinach. 3. Add the melted butter and osterize again. 4. Pour into a soup pot. 5. Cook over low heat until soup is heated throughout. Now that I’ve hit the fifth cream of vegetable soup, I’ll spare you any extra details and get right to the point. 2. 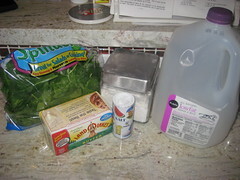 Osterize flour, milk, salt and raw spinach. 5. Heat in a soup pot over low heat until heated through. 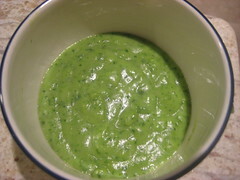 This green soup has quite a nice color to it and it tastes delicious. 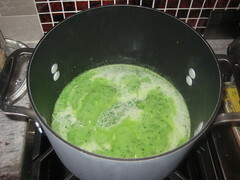 A friend called it Popeye Soup and my kids really did enjoy calling it Popeye soup as well. They were scared of it, but agreed to try it. One gagged, the other gave me the "Oh, no. I’m not trying that if he almost threw up" face. Double serving for hubby and me. Side note: You can use spinach or swiss chard interchangeably in the recipe. The book calls for espinacas o acelgas so use whichever you prefer. 1. Heat the oil and fry up the chopped onion, minced garlic and diced green pepper. 2. When onion softens, add the parsley that has been finely chopped. 3. 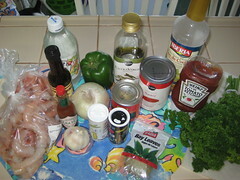 Add the pimentos, chopped, along with the liquid from the can. 4. Add the rest of the ingredients and let the sauce simmer for 30 minutes (while you make the white rice). 5. Turn off the heat, add the shrimp and cover. 6. 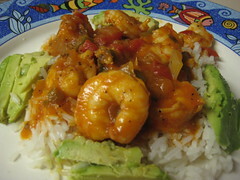 Serve immediately over white rice. When I was little, I remember Good Friday was made up of no radio, no TV, no going out to play, no laughing. You basically would sit in the house all day and think about Good Friday. I typically would spend the day with my grandparents and they’d remind me – no radio, no TV. Sit in the dark in el Florida (Florida Room), and think about why Jesus died for us. Geez, abuelo, I’m only eight years old. Can I at least talk to my brother? No. Fast forward to when I married my husband’s family and take a peek into their Good Fridays: sit in the dark, no TV, no radio. Pretty much the same, but with one exception. 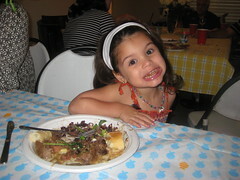 They had Camarones Enchilados on Good Friday. Now, remember that I don’t have a good memory of what I used to eat when I was little because according to my mom, it was nothing. But for all I know, maybe we were a Camarones Enchilados on Good Friday family, but I sure wouldn’t have touched those red-sauced shrimp things with a ten foot pole (remember, I was eight), but they may have been there. This year, we spent Easter in the Keys and since we had fresh shrimp within arms’ reach, I decided to give the Camarones Enchilados a try. Easy easy. Try this at home. 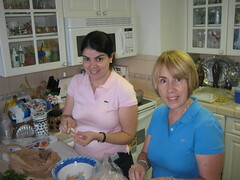 I imagine you can buy fresh shrimp that has been peeled and deveined but the two pounds I bought had my mom and I working for a good half hour before we even got started. Once the shrimp are clean and ready, the rest is super easy. You sofreir chopped onion, minced garlic and a diced green pepper until the onion is softened. Add finely chopped parsley, chopped up pimentos, along with the liquid from the pimento can, tomato sauce, ketchup, vinegar, a bay leaf, dry white cooking wine, salt, pepper, Worcestershire sauce and hot sauce. Here’s where I put my foot down. 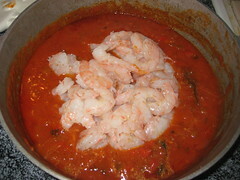 Nitza wanted me to start with the shrimp, even before the sofrito. Lady, that would have given you bouncy, rubbery shrimp. I said heck no, and added the shrimp that I had seasoned with a little salt and pepper at the end. It’s funny how there are some Nitza classics that folks in my circle use regularly, this recipe being one of those. Every single person I talked to about this dish made a commentary about adding the shrimp at the end. The shrimp and the sauce, over killer rice was amazing. Some sliced aguacates to go along the border – absolute perfection.